At Hobsons, we recognize that optimizing your college and career readiness efforts hinges on an effective implementation. The Naviance Services Team is your partner in long-term success. Our Naviance consultants are experts in helping schools and districts plan, execute, and foster their Naviance implementation to meet their unique needs and circumstances. Naviance Professional Development courses provide teachers, counselors, principals, and administrators with the knowledge and skills needed to fully realize the value of Naviance. Our comprehensive curriculum coupled with expert instruction and professional participant workbooks enable users to achieve product mastery and use Naviance to drive student success. On-Site - Participants interact with a Naviance consultant at your location. Web-Based - Participants interact with a Naviance consultant online. Our Consulting Services team has helped hundreds of clients create successful implementation plans that achieve their unique goals. Our team of experts will help your school or district create a college and career planning strategy, define the measurements for success, and gather the data required to report on all achievement. Assess. Import. Configure. Deploy. Measure. A five-phase methodology is the cornerstone of our Consulting Services. This methodology uses a hands-on approach, incorporates best practices and ensures that we provide the tools your school needs to improve student outcomes. 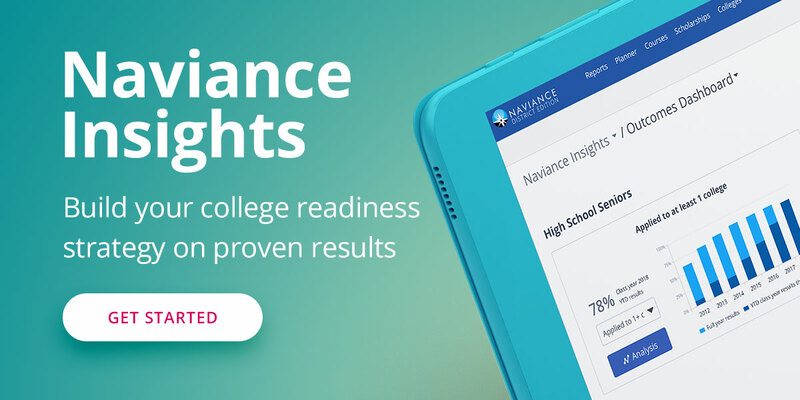 KPI Development: Develop Key Performance Indicators and Outcomes for college and career readiness to be tracked and improved via the use of Naviance. Scope & Sequence Development: Develop a holistic Scope & Sequence of college and career readiness activities for students that create a comprehensive college and career readiness program. Curriculum Customization: Customize curriculum (lesson plans and classroom aides) to improve the delivery of activities in the Scope & Sequence. Metrics & Reporting: Provide ongoing reports and measurement to assess progress and identify areas for improvement. Provide assistance and guidance to continually improve metrics. Stakeholder Onboarding: Customize and lead strategic awareness sessions for key stakeholders inside and outside of the district. Assessment: Diagnose and define functional and business requirements. Develop a custom implementation plan, including a recommended approach to identifying key roles and stakeholders such as steering committees and school site managers. Data Import: Ensure high-quality data and effective data management practices with initial import and automation of data import services. Account Setup: Share effective practices for user roles and account setup and provide general configuration assistance. District Level Functionality: Workshops and configuration to ensure a successful district-wide implementation and roll-out. Professional Development: Delivery of custom or out of the box training courses based on defined roll-out plan. Naviance Student Setup & Rollout: Set the stage for a successful district-wide implementation with workshop and configuration services for Naviance Student. This service provides guidance to create family communication strategies, planning, and content based on client practices. Naviance eDocs Implementation: Establish an effective, efficient eDocs practice with configuration and custom user documentation based on local processes. Course Planner Implementation: Professional guidance for importing course planner data, setting up course catalog and plans of study, process and implementation planning, and rollout support. Additional Communication & Support: Assistance based on needs identified during the implementation, e.g. advanced troubleshooting, custom reports, communication with schools, etc. The Naviance Support Services team is comprised of subject matter experts who are available to assist schools and districts that are implementing Naviance solutions. We pride ourselves that 96% of calls are answered by a live support specialist. To resolve your issue: Email us at support@naviance.com or call us at 866-337-0080 (toll-free) or +1-703-859-7300 (international). Support Services is available via telephone from 8:00 a.m. to 7:00 p.m. Eastern Standard Time, Monday through Friday. Online help resources and peer support are available in the Naviance Network Online Community.